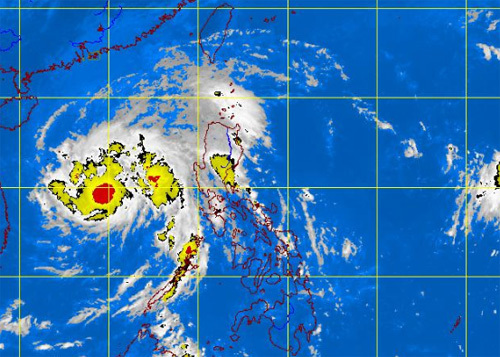 State weather expert said that Tropical Storm Ofel is expected to exit the Philippine Area of Responsibility (PAR) this Friday afternoon, and it's slightly gained strength as it continues to move away from the country. PAGASA weather bulletin as of 5:00 a.m., "Tropical Storm "OFEL" center was estimated based on satellite and surface data at 320 West of Iba, Zambales (15.0.0°N, 116.7°E) with maximum sustained winds of 75 kph near the center and gustiness of up to 90 kph. It is forecast to move West Northwest at 22 kph. " PAGASA forecaster Buddy Javier said in an interview on dzRH radio, "(Si Ofel ay) patuloy na papalayo sa ating bansa. Inaasahan nating ito lalabas ng PAR ngayong araw." Meanwhile, PAGASA advised fishing boats and other small seacrafts not to venture out into the seaboards of northern and Central Luzon due to the combined effect of Ofel and the surge of the northeast monsoon. Comments or suggestions about "Bagyong Ofel Update October 26, 2012" is important to us, you may share it by using the comment box below.